So after reading other Mailbox Mondays, I finally decided to join in the fun. This meme is hosted by Marcia at The Printed Page. You should check out her blog and see what others have received and to play along. Last week I received one book, brought to me directly from the author himself. We ended up talking for over an hour about the writing and publishing world. 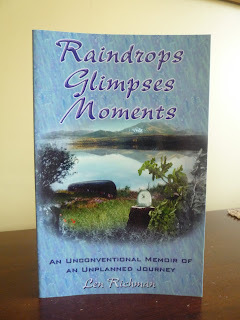 His book is a memoir entitled Raindrops, Glimpses, Moments, which received good reviews from The Montreal Review of Books. I am looking forward to reading it. So what have you received in your mailbox last week? Looks like a good one...happy reading. Welcome!! I simply love Mailbox Monday. It is a wonderful meme, and it is such a great way to see what everyone is reading. Memoirs are probably my favorite genre. Hope this is a good read for you. And I hope you keep posting to Mailbox Mondays. This sounds intriguing. And thanks for introducing me to the Montreal Review of Books!